Another 17 wins & 31 nominations. "The Savages" has been terribly mismarketed. I'm sure plenty of people who went to watch it having seen only the previews, thought it was a comedy, and were disappointed. If anything, this is a "dramedy" - it will make you smile a few times, but never laugh out loud. But that's not a bad thing, the other way around. This is a story about two siblings, Wendy (Laura Linney, who earned a surprise - and much deserved - Oscar nomination for this performance) and Jon Savage (Philip Seymour Hoffman) who have to take care of their ailing, estranged father, Lenny (Philip Bosco). Fathers and kids relationships have been discussed in tons of movies, but Tamara Jenkins (real life wife of Jim Taylor, co-author of Alexander Payne's scripts - they both produced this movie, by the way) managed to create something fresh and beautiful in its own simplicity (and, at the same time, so complex and painfully real, for all of those who've had difficult family relationships - and who hasn't?). "The Savages" reminds me of Noah Baumbach's "The Squid and the Whale", also starring Laura Linney - but with a little less humor, and perhaps even more heart. Hoffman and Bosco are also great, as usual. Jenkins proves that she's a very sensitive writer/director, and I'm excited to check whatever she does next. I'm rooting for either her or Diablo Cody ("Juno") to win the Oscar for best original screenplay next month (coincidentally, both movies have The Velvet Underground's "I'm Sticking With You" in the soundtrack). 10/10. 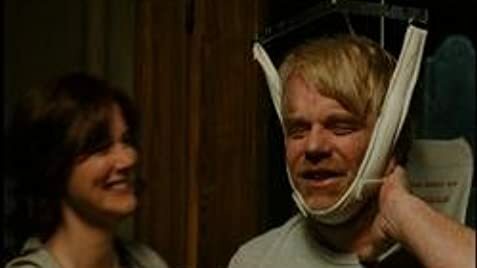 Philip Seymour Hoffman and Philip Bosco previously appeared in Nobody's Fool (1994). Jon Savage drives his Polish girlfriend to the airport at 6:30 AM, in broad daylight. But in November in Buffalo, it would be pitch dark at this hour (even on November 1, sunrise isn't until 7:46).